In today’s construction market, homeowners have the benefit of choosing from a multitude of companies. Unfortunately in many cases, the company with the lowest bid is low for a variety of reasons: they’re using inferior products; they are inexperienced; or they plan on taking shortcuts to accomplish the job at the rock bottom price. When it comes to finding a Central Virginia earthwork company, consider Reynolds Contracting. We offer competitive prices while upholding a high standard for our labor and materials. We recently completed a job for a new home in Gordonsville, constructed just in the past 6 months. This opportunity presented itself to us due to a previous contractor’s inexperience and short-cuts. 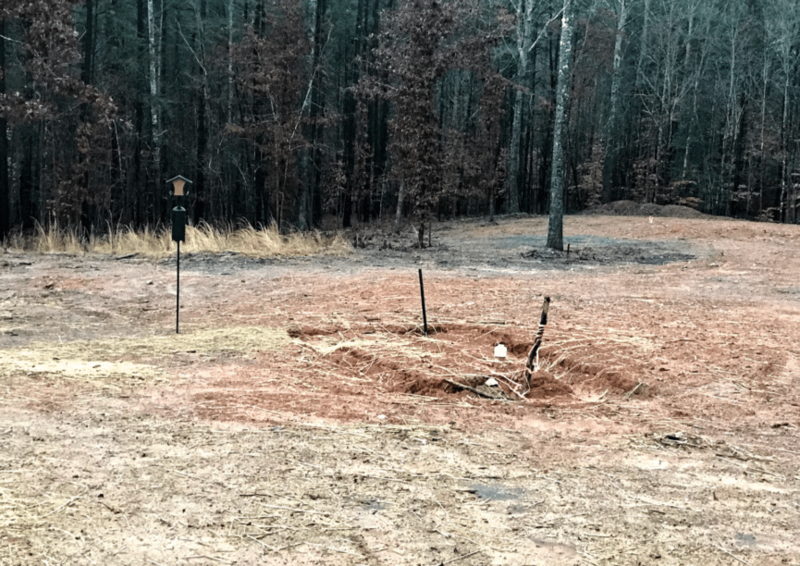 The septic tank on the property was originally excavated and backfilled, but poorly compacted – if at all. The fill dirt surrounding the tank had begun to sink. This newly constructed home should have had a great looking backyard, but the moat around the tank was a hazard and an eye sore. When choosing a contractor for your home or commercial property, be sure to hire someone that knows what they’re doing. Whatever you do, find a contractor who will backfill and compact dirt properly. If not, you will see problems like this septic tank settlement, foundation problems, or other major headaches. Sometimes these problems will come to a head quickly, as we saw on this project. But sometimes the settlement may take longer, or remain unnoticed for longer, and the problem becomes bigger in the long run. When hiring a Central Virginia earthwork company, look no further than Reynolds Contracting. We have more than 25 years of experience in the earthmoving business, from excavating to backfilling to compacting. Call us today at 434-293-6724 for an estimate on all of your earthwork needs!